This year my mom turned 60 years old. There is only 1 way to celebrate that kind of birthday…. 1,200 miles on two wheels. Leading up to the trip I had been riding the Triumph Street Scrambler demo bike and I was already in love. The bike was perfect around town and ripping around my local favorite spots. I was excited to see how he handled on a longer road trip. Our trip started by meeting up for lunch in Carpinteria. We had planned on heading out to Death Valley from there but a full-on wind storm made us change course. We decided to ride one of our favorite roads, Highway 33, through Ojai and connect to Hudson Ranch Rd. Hudson Ranch Rd is one of my favorites, particularly because there is very little traffic and it is full of perfect turns and wide open views. My mom was on her Honda Pan-European sport touring bike and me on the Triumph Street Scrambler. She was pretty jealous watching me taking turns and easily maneuvering in and out of turn-offs and parking lots. Her bike had a couple hundred pounds on the Scrambler so you can imagine the difference. After staying the night somewhere off the grape vine we pulled out our Butler Maps (I got her for her birthday) to see if there was any interesting roads nearby that we hadn’t tried yet. We found Lake Hughes Rd which connected to the 5 fwy in Castaic. It looked like just the fun kind of twisties we both love to ride. It took us right by Lake Hughes and over the mountain range into a fun little canyon road. The plan was to end up in Yuma, Arizona to visit my Grandpa (her dad). We thought we would head toward Barstow and then take the back way into Joshua Tree via hwy 247. This is the way that my mom and her crew normally come to Babes Ride Out so it was super fun to get to ride it together. The views were amazing but the wind was blowing quite a bit that day. The Scrambler handled so well and even the wind didn’t bother me that much. Once we got to Joshua Tree I told my mom that I had never actually rode my bike all the way through the park. I am normally so busy planning for the events when I am out there that I don’t always take the extra time that I should. Needless to say, we had to check it off the list. OH MAN is it stunning!!!! From one end to the other just so amazing! From rocky boulder fields, to Joshua Tree forests, to yucca fields and Ocotillo bushes. This National park is like a piece of another planet. We stopped at a few little pull-offs and every time we did, the Scrambler stole the show. So many people stopped to ask what kind of bike it was and some older Triumph fans wanted to know what year it was since it still has such a classic look. The site of an older gentlemen scoping out the lack of carburetor just never gets old. It has became a running joke over time between my mom and I, how many Scrambler fans would we meet at each gas stop. I think we landed at a grand total of 12 throughout the trip. Not bad! The road out of the park drops you on Box Canyon Rd which is the creepiest most awesome “the hills have eyes” kind of road ever. We both dug it so much that we had to pull over and snap some photos. After a quick stop for tacos in the funky little farm town of Mecca we hit the 111 hwy and back into the wind. Riding by the Salton Sea made me all kinds of inspired. I had read so much history about how it used to be such a posh place to hang out and now it is just this stagnant sea with run-down old buildings. Again, so creepy and rad all at the same time. 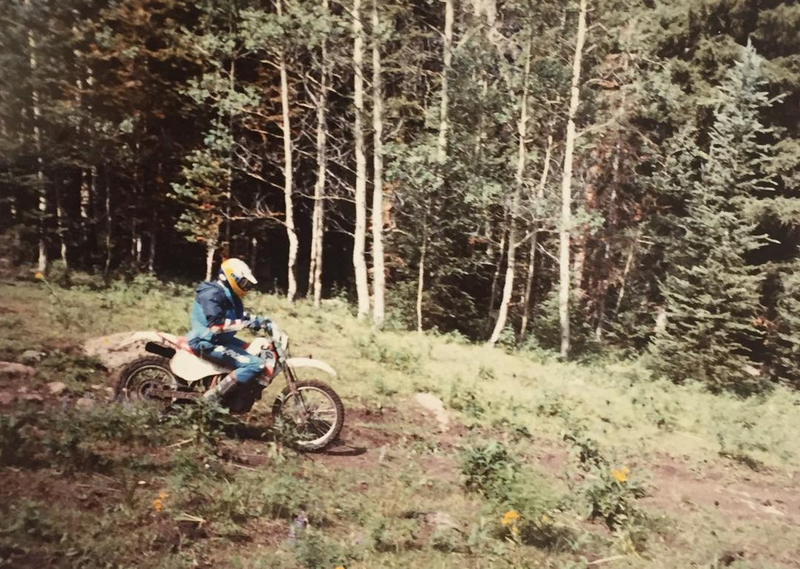 Grandpa on his KTM 600 in Colorado Grand Mesa back in the day. Heading into Yuma you just about hit the border and the Scrambler kept asking me if we could just cross on over and find some dirt roads that lead down to Baja. Sorry Scrambler, next time! To Grandpa’s house we went. After a great visit with him, filled mostly with old stories of all the motorcycles he’s had over the years, and a good night’s sleep, I was excited to finally take my mom to Borrego Springs where it all started. Yep the very first Babes Ride Out event ever back in 2013 took place in Borrego California. I showed my mom all the amazing statues that are out in the middle of the desert in Borrego before we had lunch at Carlee's and motored up the epic Montezuma Valley Rd then dropping onto the 79 and eventually the 371 the took us to the Palms to Pines highway into Idyllwild. The 371 has one of the most epic views and my mom had never been on that road so I loved to share it with her. As the palms turned into pines I made sure to pull over at one of my favorite spots near Lake Hemet to grab a photo. I feel so fortunate to be able to ride motorcycles with my mom! She is the one that got me into it in the first place and being able to share adventures like this with her is priceless! After Idyllwild we stayed the night and then took the Ortega Highway over to Silverado Canyon and back to Long Beach. After the trip was all said and done we had gone over 1,200 miles. I could not have been happier to have taken that trip on the Triumph Street Scrambler. It was the perfect road trip bike on one of the best road trips ever!